For the most part, UFO researchers try to deal with the micro, they are event oriented. That is important, but someone also needs to be looking broadly, excluding nothing. 1.- the recognition of the presence of an alien culture or cultures from outside our solar system, and the ramifications of that presence and contact. In this paper this part of the paradigm will be called the UFO/Alien phase. 2.- the recognition and restoration of our true history as a genetically engineered species, half alien Anunnaki, half indigenous Homo Erectus, according to the thesis paradigm of the Sumerian scholar, Zecharia Sitchin, and its ramifications for our future. In this paper this part of the paradigm is called the Human History phase. These are two artificial problems because the overwhelming evidence for both is patent but the obstruction of both by vested interests prevents closure. The same type, sometimes identical, patronizing vested interests and authorities obstruct the processes of revelation of the alien presence as obstruct the restoration or our half-alien history for similar and identical reasons. The resolution of the latter “problem” will relieve the political pressures on the obstructing authorities and facilitate the revelation of the former “problem”. Only by regaining our true species identity and a generic definition of human nature will we attain the global unity and unassailable integrity that will allow us to interact with an alien culture no matter how strange. Without prejudicial religious or cultural filters, we will be able to know what is good or bad for us and able to understand what is good or bad for the alien species. We may not be accepted into stellar society until we reach that level of species maturity. The two parts of the paradigm are defined, developed, their ramifications examined, and their interrelationships explicated. Practical measures for expediting and accelerating both processes are outlined and suggested, and species beneficial goals, in keeping with the fullness of human dignity and freedom, are defined in an evolutionary progressive context. The intention of the author in this paper is not to instruct but to suggest. The following is based on fifty years of interest, research, intense study, involvement, and reflection on the human condition as a generic human and professional philosopher. It is respectfully submitted for consideration as a means of facilitating a breakthrough to resolution of these matters which are now effectively and detrimentally at a standstill. A preliminary caveat: it is fully recognized that some of the sighted UFO’s, reported abductions, encountered “aliens” may be not alien but human action, technology and human events. This paper focuses only on the actual alien presence, technology and interactions. The position of the author regarding the UFO’s presence paradigm agrees with that held by the majority of the organizations addressed herein: alien civilization(s) from outside of our solar system have been visiting the Earth for an indeterminate time, the current one in focus being the gray type(s). The author has been intensely interested in the phenomenon since 1947 when, at the age of 17, he read the first report issued from Roswell, AZ of a saucer being captured after crashing. Some 50 years of research and study of the subject leaves no doubt in the mind of this author that contact by probably multiple alien races with humans has been made (the military first because of the danger of aggressive response). Information and technology has been exchanged, the population of the world gradually acclimated to the alien presence by both the aliens and the human command structure given charge of the matter. The entire UFO subject has been covered up and disavowed, at first because of fear of the unknown and possible anarchy and chaos on the part of the population, subsequently because of the difficulty of revelation and taking of blame for cover-up. The alien bodies that have been examined, autopsied and the live aliens interacted with have demonstrated that some are humanoid at least in appearance if not in physiology and some are actually androids. The “problem” is artificial in that it is only a problem because of the obstructive denial by the government. The evidence for the alien presence has developed to such a robust degree and the data is so vast that the government’s final acknowledgment is hardly needed. Even though we have the testimony of Maj. Donald E. Keyhoe, Capt. Jesse Marcel, Maurice Chatelain, Command Sgt. Major Robert Dean, Col. Phillip J. Corso, Admiral James Woolsey, Astronaut Gordon Cooper, to name only a tiny government, military and NASA handful, the supreme irony of this situation is that we continue to look to the very government which has been covering up the phenomenon for validation, verification and authentication. The reason why we have done so is due, to a great degree, to the conditioning, over thousands of years, to submit to authority stemming from the peculiar nature of our origins in subservience as brilliantly elucidated by the thesis of the Sumerian scholar, Zecharia Sitchin. The perpetuation of this subservience in the form of a sublimated “fear of God” through the religious institutions founded on it has shaped our world so profoundly that we fear to even reconsider it. We therefore rely on authority when we should not and we tend to look to anyone showing up here from off planet as masters or saviors. A fundamental question, seldom considered due to our conditioning to look to the three classic criteria bases, theology, philosophy and science which are themselves brought into question by it: Is it possible to arrive at a new world view which corrects, completes and subsumes all our previous worldviews? Explains all our previous explanations? The answer is, unequivocally, Yes. But Kuhn, who examined the nature of scientific revolutions is painfully correct. We almost have to wait for the older generation to die off rather than see an orderly and rational transition to a new paradigm. Those with vested, academic teaching or scientific reputations or religious, political or economic interests are not going to acquiesce easily or at all. We operate far behind the evolutionary leading edge in this regard because of this inertia. The Sumerian scholar, Zecharia Sitchin, published his first work in 1976. From his knowledge of Sumerian, the Semitic and other ancient languages and his research and study of the archaeological and Biblical data acquired over the last one hundred and fifty years he put forth his thesis that the transcultural gods known to all the ancient cultures were not mythological but real flesh and blood humanoid aliens, very much like humans, who had come here from the tenth planet in our solar system, Planet X in the popular press, called Nibiru by the Sumerians. They subsequently genetically engineered our species, originally as slave animals to work in their gold mines, by crossing their genes with those of Homo Erectus. Consider a typical reaction to this analysis: what is said here by this author has been presented as carefully and reasonably as possible. However, by the very fact of it being an analysis of our history and, almost incidentally, religion, it will often first be perceived as the breaking of a taboo, perhaps a suspect attack, perhaps atheistic, or somehow less than “American” in its spirit, perhaps even “against God” -- even though the evidence brought is no different in kind than that brought against the UFO’s conspiracy and, perhaps, is even more robust. The godspell is the deepest dye in the fabric of our culture. There was literally no such thing as the discipline known as Archaeology in Western culture until the 1800’s. The Roman Church controlled and determined the view of the past. Bishop Usher’s view, that the entire planet and life on it as described in Genesis came into existence through the auspices of a cosmic creator in 4004 B.C., was doctrine and one could be branded a heretic for disavowing it. Not until paleontological findings forced that view to be reevaluated and Schliemann, a wealthy German merchant, refusing to admit that the ancient cities and peoples were legend, dug up Troy, was a window into the past opened and the mythic view questioned. Scientific Archaeology as we know it came into existence only when academics reluctantly had to acknowledge the past being dug up and collected by amateurs in the Middle East. Archaeologists came to be mistrusted and hated by the religious institutions who feared revelations that would contradict their teachings and the history of the Old Testament. Those still holding the mythological interpretation are in an unenviable position. They find themselves having to hold that the same citizens of the first civilizations who, they claim, invented -- or hallucinated -- the gods through their primitive imaginings and naive proto-scientific projections of personality on the great forces of nature were the same primitives who somehow could build the stupendous Giza pyramid; somehow quarry, cut and move into place the one thousand ton stones of the Baalbek “temple” (rocket platform) which even our modern technology cannot begin to lift; somehow know the great precessional cycle of the heavens, the existence of all ten of the planets of our solar system and how our solar system was formed (Enuma Elish document). To escape this awkward dilemma, some fall back on the explanation that there “must” have been an even earlier civilization, lost now in the mists of time, the identity of which we cannot know which “must” have been destroyed or declined --- but which somehow left just enough technology and knowledge laying around to jump start the early civilizations we know. But they must hold this interpretation against the clear declaration of the Sumerian and all other ancient peoples that the gods were real flesh and blood, present to them, who gave them civilization. The physical locations of the ancient legends as mythic has been gradually disproven beginning with the work of Schliemann (a German merchant who refused to believe that the legendary ancient cities were mythic and risked his money to go to the middle east with ancient maps and dug up Troy, thereby breaking open the seal of myth) and completed with the re-discovery of all the ancient cities and centers on all continents. 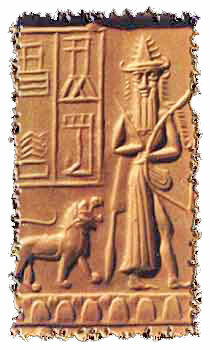 The events involving the “gods” of ancient times and the technology attributed to them, considered as myth and naive legend, has been gradually disproven, beginning with the discovery of documents from the most ancient cities and reinforced with the discovery of the great library of Ashurbanipal at Nineveh and the gradual accumulation of some two million pieces of artifact and document confirming those events in great detail. The discovery of ooparts, high tech tools, toys, artifacts, and technology along with documentation of advanced scientific knowledge ostensibly out of place in time along with astronomical knowledge of the entire solar system beyond our current level has reinforced the negation of the mythic interpretation. The interpretation of the “gods”, the Anunnaki themselves, as mythic, unreal beings (academic mythologists) and Jungian archetypes (Joseph Campbell) and the relegation of them to schizophrenic hallucination (Julian Jaynes) has been gradually disproven beginning with the acknowledgment of the reality of the events attributed to them; the discounting of the arguments for their unreality due to the seeming fantastic deeds attributed to them by the development of our technology (rockets, lasers, radio communication, genetic engineering, atomic and particle beam weapons) that duplicate those feats. This interpretation has been implemented further by the pioneering exploration and questions posed by von Daniken and then completed by the comprehensive and brilliant demonstrations of Sitchin and Sir Laurence Gardner, the English historian and genealogist. The mythic interpretation has been supported by religions because to recognize the Anunnaki as real would be to open the door to a radical reinterpretation of the entire phenomenon of religion and put into question the real identity of the very deity at center of their belief system. Gardner has brought to light, however, the fact that there exists a robust, highly documented history carrying all the way back to the Anunnaki, possessed by the heterodox tradition of Christianity. This tradition is the one branded heretical and murderously persecuted by the Roman Church before and during the Inquisition. There was no Dark Ages for this tradition, only for those whom the Church wanted to keep in the dark about the real nature of human history. Now that we have begun by walking on the moon and exploring the solar system and have probes going starward, the possibility of an alien civilization coming here is taken for granted and one coming here from inside our solar system trivial, rather than unreal myth. “Mythinformation”, after two hundred years of failure, although still hiding behind tenure in the university, is a dead issue. Working from the same archaeological discoveries, artifacts, and recovered records as archaeologists and linguists have for two hundred years, Sitchin propounds – proves, in the opinion of this author --that the Anunnaki (Sumerian: “those who came down from the heavens”), an advanced civilization from the tenth planet in our solar system, splashed down in the Persian gulf area around 432,000 years ago, colonized the planet, with the purpose of obtaining large quantities of gold. Some 250,000 years ago the recovered documents tell us their lower echelon miners rebelled against the conditions in the mines and the Anunnaki directorate decided to create a creature to take their place. Enki, their chief scientist and Ninhursag their chief medical officer, after getting no satisfactory results splicing animal and homo-erectus genes, merged their Anunnaki genes with that of Homo-Erectus and produced us, homo sapiens, a genetically bicameral species, for their purposes as slaves. Because we were a hybrid we could not procreate. The demand for us as workers became greater and we were genetically manipulated to reproduce. Eventually, we became so numerous that some of us were expelled from the Anunnaki city centers, gradually spreading over the planet. Having become a stable genetic stock and developing more precociously than, perhaps, the Anunnaki had anticipated, the Anunnaki began to be attracted to humans as sexual partners and children were born of these unions. This was unacceptable to the majority of the Anunnaki high council and it was decided to wipe out the human population through a flood that was predictable when Nibiru, the tenth in our solar system and the Anunnaki home planet, came through the inner solar system again (around 12,500 years ago) on one of its periodic 3600 year returns. Some humans were saved by the action of the Anunnaki, Enki, who was sympathetic to the humans he had originally genetically created. For thousands of years we were their slaves, their workers, their servants, their soldiers in their political battles among themselves. The Anunnaki used us in the construction of their palaces (we retroproject the religious notion of temple on these now), their cities, their mining and refining complexes and their astronomical installations on all the continents. They expanded from Mesopotamia to Egypt to India to South and Central America and the stamp of their presence can be found in the farthest reaches of the planet. Around 6000 years ago they, probably realizing that they were going to phase off the planet, began to gradually bring humans to independence. Sumer, a human civilization, amazing in its “sudden” and mature and highly advanced character was set up under their tutelage in Mesopotamia, human kings were inaugurated as go-betweens, foremen of the human populations answering to the Annunaki. Some humans were taught technology, mathematics, astronomy, advanced crafts and the ways of civilized society. The high civilizations of Egypt and Central America arose. The Anunnaki became somewhat more remote from humans. By around 1250 B.C. they had gone into their final phase-out mode. The human population and the foremen kings, now left on their own, began to fend for themselves. For some three thousand years, subsequently, we humans have been going through a traumatic transition to independence. Proprietary claims made by various groups of humans as to who knew what we should be doing to get the Anunnaki to return or when they returned, perpetuated the palace and social rituals learned under the Anunnaki and sometimes disagreement and strife broke out between them. Religion, as we know it, took form, focused on the “god” or “gods”, clearly and unambiguously known to the humans who were in contact with them as imperfect, flesh and blood humanoids, now absent. It was only much later that the Anunnaki were eventually sublimated into cosmic character and status and, later on, mythologized due to remoteness in time. A key underpinning of the Sitchin paradigm is the existence, now or in the past, of the tenth planet in our solar system, the home planet of the Anunnaki with the size, orbit, characteristics described, as Sitchin has demonstrated, in the Enuma Elish and corroborated by Harrington. Tombaugh discovered Pluto in 1930. Christie, of the U.S. Naval Observatory, discovered Charon, Pluto’s moon, in 1978. The characteristics of Pluto derivable from the nature of Charon demonstrated that there must still be a large planet undiscovered because Pluto could not be the cause of the residuals, the “wobbles” in the orbital paths of Uranus and Neptune clearly identifiable. The IRAS (Infrared Astronomical Satellite), during ’83 -’84, produced observations of a tenth planet so robust that one of the astronomers on the project said that “all that remains is to name it” -- from which point the information has become curiously guarded. In 1992 Harrington and Van Flandern of the Naval Observatory, working with all the information they had at hand, published their findings and opinion that there is, indeed, a tenth planet, even calling it an “intruder” planet. Andersen of JPL later publicly expressed his belief that it could possibly be verified any time. The search was narrowed to the southern skies, below the ecliptic. Harrington invited Sitchin, having read his book and translations of the Enuma Elish, to a meeting at his office and they correlated the current findings with the ancient records and Harrington acknowledged the detail of the ancient records while indicating where the tenth planet may now be in the solar system. The most recent and quite amazing oopart is the rediscovery of monoatomic gold by David Hudson (Monoatomic are superconductors at room temperature, have anti-gravitic properties and are only now being investigated by the advanced physics community) Hudson’s discovery, correlated with the bringing to light, by Gardner, of the suppressed discovery of the Anunnaki gold processing plant on Mt. Horeb by Sir Flinders Petrie in 1889 demonstrates that the monoatomics were already known at least 3000 years ago. These ooparts, coupled with evidence from many disciplines and the historical records indicate that an advanced civilization existed in those times possessing a high technology and that that civilization was indeed the Anunnaki. Sitchin has no doubt that, all the evidence and the testimony of the early humans themselves, indicate that that civilization was, indeed, the Anunnaki. The documentary evidence, i.e. 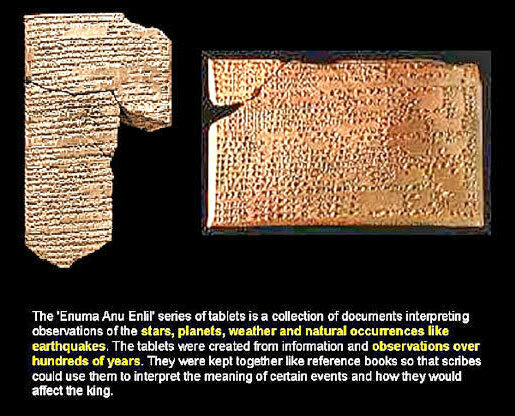 the historical documentation for the existence and deeds of the Anunnaki, has been available to us since the early 1800’s. The excavation of the ancients sites of Mesopotamia brought to light the amazingly advanced civilization of Sumer and, with it, thousands of clay tablets containing not only mundane records of commerce, marriages, military actions and astronomical calculation systems but of the history of the Anunnaki themselves. It is clear from these records that the Sumerians knew these aliens to be real flesh and blood. The library of the ruler, Ashurbanipal, at Nineveh was discovered to have burnt down and the clay tablets held there were fired, preserving them for our reading. Even to this day, more and more records are discovered. One of the most impressive finds, in very recent time, has been a sealed, nine foot by 6 foot room in Sippar holding, neatly arranged on shelves, a set of some 400 elaborate clay tablets containing an unbroken record of the history of those ancient times, a sort of time capsule. Again, the evidence is so overwhelming and robust that , if it weren’t for those with power enough to suppress, it would have been accepted and our world view changed a century ago or perhaps sooner. there was a creation event but it was a genetic engineering process; there is an evolutionary process but it was interrupted in our regard by the Anunnaki for their own practical purposes. We shall be forced to introduce an additional category: a synthesized species. A straightforward approach to prove or disprove the Sitchin paradigm is available from astronomy. A thorough, professional search of our solar system should be able with current technology to determine the existence or non-existence of a tenth planet with the characteristics of size, orbit, orbital periodicity, declination from the ecliptic, as Sitchin has determined from the translations of the ancient records and particularly the Enuma Elish document. If that planet is not in our solar system or no evidence can be found for an ejection or cataclysmic destructive event then the Sitchin paradigm falls. This search should be undertaken with highest priority. The matter is sufficiently important to clearing up our historical situation that the academic world should be involved as well as the scientific community. It is the opinion of this author that, in light of the evidence already obtained through the use of the Pioneer 10 and 11 and two Voyager space craft, the Infrared Imaging Satellite (IRAS, ‘83-84) and the data available to Harrington when consulting with Sitchin that the search has already been accomplished, in fact that the planet has already been found. It is interesting that Harrington dispatched an appropriate telescope to Black Birch, New Zealand to get a visual confirmation, based on the data leading to the expectation that it would be below the ecliptic in the southern skies at this point in its orbit. On Harrington’s early death the scope was immediately called back --- as one observer noted, “almost before he was cold”. To acknowledge a tenth planet is to open up the possibility of the Anunnaki’s existence. The reason for the downplaying of the data, the difficulty of obtaining it, the performance of the scientists publicly speaking about it, all have the same flavor as the Air Force’s handling of the Roswell matter. Obviously, even before any official confirmation of the existence of Nibiru/Planet X in our system and certainly afterward, a focused scan in its direction by a modified SETI type search that used all appropriate parts of the energy spectrum including our own radio and TV common frequencies would be productive in determining the existence of intelligent life continuing to exist thereon. To anticipate a possible mystery: even if the planet it confirmed, it is possible that no intelligent signals may be received. This is a conjecture, only, on the part of the author but, in light of the kind of summary withdrawal and lack of subsequent contact by the Anunnaki, it is not inconceivable that any artificial signal output has been masked. This hypothesis is based on a conclusion that one of the major reasons for their phasing off this planet was not just because they needed a ballistic rocket launch window to reach their planet when it came through the inner solar system last time but because they had come to realize that we needed to be left on our own to find our own species identity. A scan of this type should be undertaken immediately. It should be assumed that our signals have been monitored since their phase-off. A second mode of proof or disproof is available through genetics. We will shortly have the entire human genome read out. That process and the information available as a result should afford us the opportunity to examine the entire genome for the evidence of the merging of the two species gene codes, Homo Erectus and Anunnaki. A protocol for such a novel determination would have to be developed. A potential problem may lie in the fact that the melding took place some 250,000 –200,000 years ago. A practical spin-off of the effort may be not only the identification of the two codes or, at least, the indication of the basic merging, but evidence for why we have some four thousand cataloged genetic diseases and other species on this planet hardly any at all. It is at least a reasonable speculation that imperfections due to the complexity of the major merging of the two genomes is the cause of those defects in the first place. We recommend that this investigation be implemented again with highest priority for the sake of proving or disproving the Sitchin paradigm. The overwhelming evidence from the Sitchin paradigm demonstrates conclusively that we were genetically engineered by the Anunnaki and treated as slaves and then limited partners but always as subservient to them. The major ramification (Neil Freer: Breaking the Godspell) of the Sitchin explication is that “religion”, as we have known it, is the transmutation, the transmutation of the Anunnaki-human relationship of master-subject servitude, of slavery and then limited, subservient partnership. The Anunnaki phased off this planet at the latest around 1250 B.C. Since then, we have been going through phases of a traumatic transition to species maturity and independence. The major characteristic of this process has been the transmutation in all cultures of them, in particular Enlil/Jehovah in Western culture, into a cosmic deity, commonly called “God" in the Judaeo-Christian tradition. Is this atheism? No, not as such. It simply is a long overdue correction of some local, intra-solar system politics, relatively rather pedestrian in cosmic perspective. Garden variety atheism can now be understood as an early sign of precocious species adolescent rebellion and questioning of the authority of the obviously all too humanoid characteristics of the particular local Nefilim "god" of the Hebrew tribe and Christianity, Yahweh/Jehovah. The new paradigm, once the ancient, subservient godspell is dispelled, simply frees us to go one on one with the universe and to seek directly whatever unthinkable or thinkable ultimate principle is behind it. In a later phase we have mythologized them into unreal beings and then, more “sophisticatedly” into psychological archetypes. Only with cumulative evidence and restored history through modern scholarship have we now been enabled to grasp the true nature of our genetic creation, our traumatic transition, and the opportunity to emerge from species adolescence and amnesia into species maturity. "What do I do when my master is no longer here to instruct me... what shall I tell the people." We went into grief, despair, denial. We blamed ourselves and looked to the sky for their return. The good kings did their best, the leaders sometimes were told to go up the mountain to get some instructions long distance from space or make a wooden box lined with metal just so to act as a receiver. "Now hear this". Finally we were alone and in confusion, beginning to fight over who still knew what the master really said, really meant, what we really should be doing if he did show up. Service at their table transmuted into ritual sacrifice of food, attendance at their baths turned into bathing and clothing of surrogate statues of them and gradually the routine services turned into cargo cult rituals and their palaces became empty temples. And the less than good kings began to take advantage, began to swagger. Sometimes they got away with it on their own. Sometimes the people, in desperation, raised their king to a symbolic god. And the god-king and the seed of the notion of the divine right of kings became. And the chief servants went along with it because it was to their advantage to become known as priests or to preserve their jobs and status. And those who had been taught, seeing that the advanced knowledge of technologies and science and the arts, learned as part of their function, of writing, mathematics, astronomy, science, metallurgy, and the fine crafts in general was being lost set an agenda to preserve it. In the face of misunderstanding and threat they disguised it, withdrew it, hid it. And the "occult" became. Eventually, the situation evolved to a very macabre stage. In an effort to demonstrate our subservience and zeal to make things right if they would just come back we kept the rules, we maintained the routines of service but , after a long time of disappointment, we reached a point of abject, abysmal desperation where we would do anything to get them to come back -- and we did. Remembering the Nefilim males’ attraction to our young women, we began to cut their hearts out on top of the empty pyramidal palaces in a collective craven pleading shriek to the heavens from whence they had come and gone. But that unspeakable and unappreciated horror could not last: we began to doubt, to entertain frightening cynicism, secret thoughts of independence and why bother. Slowly a classic dissociative process developed due to separation in time and we began to sublimate the flesh and blood Nefilim into cosmic absolutes and their personalities into mythic archetypes. Looking back over the history of our species the traumatic transition we have gone through might well be characterized as the creation of the concept of a cosmic God by us, through a series of psychological mutational phases. Eventually, we simply began to forget. The transition from species amnesia to species maturity has been a very traumatic passage. Breaking the godspell has seen us go through the stages of abandonment to dissociation, to transmutation to religion to rebellion and now to recovery. It is analogous to the dysfunctional family syndrome on a planetary scale. So, down to our day, incredibly, we have remained still Babel-factored for good crowd control, broken into tribes each proprietarily telling the other that ours is the only accurate tradition of what some particular “god” intended, what rules to follow, what we should be doing to demonstrate we are still loyal and docile servants. Sometimes we just kill each other over it. And persecutions, Crusades, Jihads, Inquisitions, evil empires, the saved and the damned, the martyr, the infidel, the saint, the protestant, the fundamentalist, the atheist, became -- and remain. It is the nature of the historical events by which Yahweh/Jehovah became the monotheistic (single, supreme -- and alien) “god” of the Hebrews which furnishes the third key to how the UFO/Alien and the Sitchin Human History Paradigm are interrelated. Modern scholarship, working on the foundations laid as far back as the German school, has reassessed the Old Testament. When the Mesopotamian records began to be unearthed in the 1800’s, it was realized that the history revealed from 4000 B.C. forward, was the source of the history of the Old Testament. The Jews, allowed to be confined to captivity by the Babylonians by their “god” Jehovah, had drawn on that history and committed forgery (Sitchin) by rewriting it to their need to establish Enlil/Jehovah as their supreme ruler. That history shows clearly that two Anunnaki brothers, Enlil and Enki had always been at odds with each other personally and politically. Enki was the Anunnaki scientist who, together with his half-sister scientist sister, Ninhursag, had created humans and had always been favorable to them. Enlil had always had reservations about humans and dominated them with severity. Gardner has made the case (Bloodline Of The Holy Grail, Genesis Of the Grail Kings) that when the Old Testament referred to The Lord (Adonai, Enki) it was when good things were being done to or for the Hebrews. When terrible things were being done or allowed to happen to them, the reference was always to Jehovah/Yahweh, Enlil) and it was to Enlil’s dominance that they finally capitulated and worshipped in fear. Enki (The Lord, Adonai) initiated a bloodline of human leaders, further enhanced with Anunnaki genes and taught the advanced scientific knowledge they possessed (Gardner). This royal bloodline, coming down through David and the anointed messiehs (anointed ones) was recognized but treated ambiguously by the large faction of the Hebrews who paid allegiance to Enlil. The Old Testament, a collection of books from which some considered unacceptable were excluded because they would contradict the forgeries necessary to establish Enlil as supreme, promulgates a religious attitude based in subservience and “fear of God”. It is this attitude, an extension of the ancient master-slave relationship which is at root of Western culture and the pervasive looking to the holders of power and dominance as ultimate and often absolute authority. The scenario replayed itself when the strain of Judaism that eventually became known as Christian allied itself with Rome and became the Roman Church. It perpetuated the Enlil type fear of God tradition and, in its turn, suppressed, persecuted and brutalized the human-centered strain of Christianity springing from the tradition fostered by Enki. It was this powerful religion of the Bishops and the Inquisition which could torture, main and kill to dominate and control that also controlled and dictated to the early Universities. Our schools of higher “learning” still parade the trappings of the Medieval university on ceremonial occasions and, unfortunately, all too often still in their limitation of discussion to approved subjects. This policy and position of dominant absolute authority on the part of the Roman Church extended itself gradually in the modality of the Roman political and military way and controlled and formed governments and government policies through kings and queens whose crowns were bestowed by the Church. Its policies unchanged, the Inquisition exists under the title of the Sacred Congregation. The latter day solution to the religious mayhem, always just under the surface, developed in the U. S. Constitution, still saw it necessary to give deference to the fearful God of the Judeo-Christian tradition, Yahweh/Jehovah -- Enlil the Anunnaki, alien “god”. The focus of the control and suppression of information turns out to be identical: the existence and presence, action and interaction of an alien, intra-solar system civilization in the past and possibly contemporaneously (HH); the existence and presence, action and interaction of an alien, extrasolar system civilization in the past and contemporaneously (UFOA). The type of authority and their agenda in enacting the control and suppression are similar: the dominant power players in the Judaeo and Christian contexts working to patronizingly consolidate a proprietary religio-political regime in self-interest and corrupted from the original ideal; the dominant power players in our society working, probably sincerely at first but, subsequently, patronizingly, to consolidate a political regime in self-interest and corrupted from the Democratic ideal. It is not surprising, therefore, in light of our half-alien but subservient slave background, that we have tolerated the patronizing forgeries and abuses of authority that have been exercised by those who have controlled the UFO/Alien situation since at least the ‘40’s. It is not surprising that so many react, almost reflexively, to the possibility of another race coming here from the stars or a tenth planet in our own solar system by immediately assuming their superiority and benevolence or power to control. If we have been looking to the sky for some three thousand years for Daddy to return from where the Anunnaki went when phasing off the planet, waiting for their return to make everything right and tell us what to do, we put ourselves in the dangerous and highly vulnerable position of being taken over by anything that happens to show up here --- even if they are androids. We must break this godspell to become fully effective and independent. It is not surprising that even those who recognize the reality of the alien presence now and the half-alien nature of our own genetic background can still be taken in by demands for subservience. Some new age lecturers would lead people up the mountain where they expect the space ship to land and the rescued to be incorporated into some alien sub-culture. Some would claim that we should allow ourselves to become GI-Joes in some alien conflict between purported light and dark forces so that we can be rewarded by the victorious light leader and given advanced technology at the victory picnic. Consider even the U.S. Constitution in the godspell perspective: it was constructed to create a society where a religiously pluralistic population could coexist with the minimum of inter-denominational mayhem. A result of this enforced acceptance of Babel-factored plurality has been an uncomfortable protocol of avoidance of discussion and an attitude that any criticism is automatically partisan prejudice. This makes extremely difficult any impartial reexamination and evaluation of the history of the race because it is, in effect, inescapably, some denomination’s “religious” history. The religious background and belief systems of UFO investigators, politicians, scientists cause internal conflicts that often enervate their efforts . The degree of evolvement of the consciousness of the scientist, the scholar, the politician, the philosopher, the UFO investigator determines the level of effectiveness of their actions. The most expert of UFO investigators who is still looking for some superior being to show up to help us out, "save" us, instruct us, is looking through an outmoded and restrictive, even submissive filter. The scientist who ignores or denies the evidence for the alien presence, present and past, due to peer, grant, government or religious pressures is just as limited. The denial or ignoring of the evidence of alien presence, present and past and directly connected with our own origins by SETI is analogous to the denial or ignoring of the archaeological evidence for the presence and role of the Anunnaki in our past by the sciences and religions of the world. The attitudes we have exhibited, the ways in which we have acted and the way in which we have let ourselves be manipulated by the controlling powers with regard to UFO/Alien presence and our own species history and the postures we continue to exhibit clearly are the direct offshoot of our ancient subservient godspell background and history. It is the conviction of this author that, unless and until we restore our true history, attain a generic, consensual definition and understanding of what a human being is and step out of species adolescence thereby, we shall not resolve the current UFO/alien questions fully because we will not have the species maturity and planetary unity to be able to interact gracefully with a strange species, knowing easily what is acceptable and unacceptable for both of us. Restoration of our true half alien history, however, will free us to attain the unassailable species integrity to enable us to demand and present credentials, determine intent, agenda, and negotiate confidently so that we are accepted into stellar society with full dignity. It will enable us to have the individual and species self confidence and perspective that will prevent us from being manipulated, intimidated or conquered by whomever is here or shows up here in the future. Only this kind of integration will allow us to gain explanations and understanding of many details of both the HH and UFOA scenarios. The elucidation of the Anunnaki alien presence in the past explains the presence of ooparts, the puzzles concerning “sudden” civilizations, our non-standard evolutionary progress and our unique gene code, and resolves the Creationist-Evolutionary conflict. The understanding of our bicameral racial heritages, homo-erectus and Anunnaki and our genetic creation for pragmatic Anunnaki purposes may explain why we have four thousand plus genetic diseases due to imperfections in the genetic synthesis while other species on this planet have few or none. A more precise and complete overview of our past enables us to differentiate between myth, mythic beings and aliens of whatever type have manifest or come here in the past and present and will aid us in differentiating and dealing with aliens in the future. That we are literally half alien genetically throws the entire question of the alien reality into a far different perspective. There are several possible reasonable scenarios presented by the expansion of the alien paradigm. They are simply listed here, without weighted evaluation, for the consideration of the reader. A preliminary note: Not long ago, one could be in very serious trouble with religious authorities by expressing belief that there could be other races from other places -- much less other dimensions (Giordano Bruno, a monk who claimed that was burnt at the stake by the Church only a few years before the founding of Harvard University). The notion of dimensions beyond our comfortable three is relatively novel and still partially speculative; physicists still holding for various actual counts. It is understandable, therefore, that a sort of aura of mystery and awe, sometimes almost transcendentally religious, is projected on “dimensionality”. The added precision of differentiation afforded by this expansion of perspective removes the mystical halo from the concept of “interdimensional” applied to some aliens. It may well be true, quite probably is true, that some aliens and their technologies and, therefore, their relative consciousness, involve modalities which use or operate in dimensions other than the three which we are accustomed to perceive. Physics, human or alien, however, is still physics – whether of this sub universe or another. It will be easier to deal with whatever physics manifests or is discovered as the subliminal mystical elements are dismissed from out thinking and the knee-jerk – or, perhaps, knee bending – subservient godspell reflex is eliminated. If Nibiru, the Anunnaki home planet and tenth in our solar system still exists in orbit in our solar system (not having been involved in some destructive catastrophic or ejection event) there is reasonable expectation that the Anunnaki still exist. The evidence gathered by the investigation using the IRAS in 83-’84 for that planet still existing in our solar system was enough to convince Harrington of the Naval Observatory. Some greasy and other types may be found to be robots and androids of the Annunaki, used as remote probes or perhaps routine monitoring of this planet, as cautiously used envoys, perhaps sacrificed in crashes as a safe, sterile and non threatening introductory manifestation (Roswell). The correlation with the recorded prophecies in the Mayan Codex of the appearance of many videotaped UFOs over Mexico at the time of the 1991 eclipse of the sun and subsequently, because of the association of the Anunnaki with the Central American early civilizations, may point to these saucers being Anunnaki. Some grays and other types may be from extrasolar system societies and fully humanoid or android and to be differentiated from Anunnaki associated androids. Some extra-solar system types may be known to, unknown to, friendly with, antagonistic to, have an active relationship with the Anunnaki. It may be that there is, as has been alleged or claimed by some, direct cooperation/collusion with an alien species on the part of some humans of socio-economic international influence, for the purpose of controlling the population and, perhaps, even the planet. In the cases where those aliens turn out to be Anunnaki, the two parts of the paradigm will merge completely. Representations of some creatures in the Anunnaki time period in the Middle East bear striking resemblance to the descriptions and depictions of the gray type aliens known in modern times. Sitchin’s interpretations of some of these images and detailed descriptions are that they were robots and androids developed and used by the Anunnaki. It is this author’s opinion that the alien presence matter is simply old and, at the present stage of our collective understanding and reaction to it, becoming rather boring. The progress we are making with these artificial problems is far behind the leading edge of our evolution and we suffer from the artificial retardation. It is evident that those who found themselves with the responsibility for handling the UFOA phenomenon from at least the time of Roswell conspired to conceal it for the general purpose of learning the technology for weapons and defense but equally because of the concern that the general population would be devastatingly disrupted. Restoring our true half-alien history will remove the naive, parochial and religious handicaps and afford a species maturity, cosmic perspective and independence that may reassure those charged with dealing with the UFOA matter that the disruptions and chaos in the general public anticipated on revelation will definitely not take place. That they have been acting in a patronizing way toward the citizens of this country is, in a real sense, a reflection of their own limitations, a product of their military type approach which, as Corso said, challenged on a simple “friend or foe” basis. They need an opportunity to inform the public that will save enough face for them and this could be the item that affords it. They will advance the argument that the public had and has no concept of the dangers and threats from the aliens, no concept of the strangeness of their science and their society and their intentions and the degree of advancement of their evolution over ours. This level of species consciousness and independence disengages the individual from subservience to and reliance on this kind of patronizing authority and they will no longer be even needed. We will see the inevitable struggle to preserve their power on the part of the least evolved of them, a graceful recognition of the requisite species maturation and resultant resignation of that power on the part of the more evolved of them. It is not as if they have possessed exclusive knowledge of the situation all along. The UFOA phenomenon has always manifest an element of direct contact with the general public through physical manifestations of craft, abduction, direct communication of information, quite clearly on a gradual, planned and orchestrated basis at least on the part of some species. Perhaps if those who control realize that we will simply go on without them they will understand that it is no longer either necessary to patronize the general public or “protect” that classic fiction the “ordinary person”. The evaluations of the information contained herein and decisions whether to consider and incorporate it into the agendas of the various organizations addressed, ironically and paradoxically, will be influenced by the same factors elucidated herein as counterproductive and suppressive. Some will look to academia or establishment science as a criterion and reject it for fear of loosing contact with those worlds that survive on government grants. Some will deem it too difficult because the UFOA matter is already so controversial that to incorporate it will, in their minds, complexify the situation to the point of being unwieldy -- or too politically incorrect. Some will reject it simply because they feel it will offend religious groups and alienate those who might otherwise give support or at least be open to influence. It is a thing of great mystification and awe to witness a champion of the UFOA cause who is ready to take on any governmental authority cower before “religious” institutional authority. Some in the UFOA community will reject it, most ironically, because it contradicts their personal religious or metaphysical or philosophical or new age belief system without a serious consideration of the facts. There are, however, a growing number of those who have freed themselves from the imprints and conditioning of their cultures and their religions sufficiently to be able to integrate both halves of the alien paradigm into their thinking and worldview. They have reached the genetic enlightenment afforded by the restoration of our true history and it has enabled them to expand to integrate the UFOA phase. This expansion has empowered them to think and decide for themselves concerning the overwhelming mass of evidence for both the UFOA presence and the HH Sitchin worldview, and to move beyond both governmental and religious obfuscation and obstructions. For them, the Paradigm Clock has struck twelve long ago and they are about the business of becoming their own evolutionary artists and preparing to meet the aliens and prepared to restore relations with the Anunnaki. They have already experienced and passed beyond the profound paradigm shift anticipated and predicted by so many. In a real sense they are the paradigm shift: they are finished with this phase of investigation, speculation, the forcing of revelation. The current UFOA situation is like an old ‘40’s movie: the resistance to the HH Sitchin phase like an academic soap opera in the faculty room. They are free to answer the question “What does it all mean?” with “Whatever we wish to make it” because they are free to experience the universe as a plenum of radical freedom in which interaction with other species is only another significant activity. If the aliens choose those with whom they will make first overt, public contact it will most likely be from this group. They are their own persons with an unassailable integrity and self knowledge and confidence and sensitivity that will allow them to interact easily and intelligently without fear, subservience or cramping preconceptions. It is from within this group that the clarity of vision for the next phase will come, is already manifesting: the simple, logical, gathering and implementation of contact ready teams. They know who they are and they easily recognize their kind. They know that they must be beyond the archaic divisions of parochial, national, political, and social turf borders. They know they cannot be without a common human history, cannot be at odds with each other in their basic conception of what a human being is, cannot be separated on the basis of religious belief. They know they cannot wait for the masses of the bell curve because they are the vanguard and they know their genetic evolutionary role well. It is this expanded, radically free, self confident and fully independent consciousness that is the key to the next step: direct, overt, contact and communication and species interchange with whomever chooses to initiate it first in that mode. It may be a species from outside our solar system, it may be a species from inside our solar system and, therefore, most probably in that case, the Anunnaki. It will make little difference to these futant humans because they will have the information and perspective to comprehend and evaluate and interact. The first project of these new humans will be the development of a universal translator modality based on the principle of self-reference. The general principles and practical application have already been established. The author intends this to be the subject of a second paper.